Health care for a baby begins before birth. 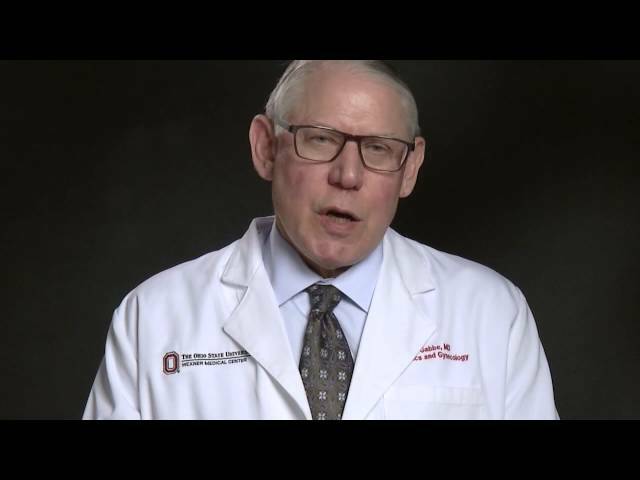 That’s why the Fetal Treatment Program at The Ohio State University Wexner Medical Center offers the most advanced level of personalized health care available to both mother and developing baby before birth. The majority of our fetal care plans involve diagnosis, counseling, education, emotional support and planning for both delivery and care after baby is born. Only a few pregnancies require medical or surgical treatments before delivery. For those rare occurrences, we evaluate and treat a developing fetus in the womb to correct problems before birth. The goal is to help baby in the early stages of life and throughout fetal development to correct complications that could form the basis of later-in-life diseases, such as high blood pressure or heart disease. Most importantly, our maternal fetal medicine physicians work with you and your primary obstetrician/gynecologist. While your Ob/Gyn may continue to provide your routine pregnancy care, we offer the most advanced maternal fetal screenings and diagnostic procedures to verify and diagnose any abnormality, and then provide the most comprehensive fetal treatment options available. Established in 1992, Ohio State’s Wexner Medical Center’s Fetal Treatment Program is the longest-standing fetal care center in the area. We are one of only 20 medical centers in the United States and Canada, and the only one in central Ohio, that are members of the North American Fetal Therapy Network (NAFTNet). This means we have established expertise in fetal surgery and other forms of care for complex disorders of the fetus. We also are a member of the Ohio Fetal Medicine Collaborative, a joint program between local hospitals and Nationwide Children's Hospital. In addition, our physicians are actively involved in clinical research and have participated in the development and testing of many of the fetal and diagnostic procedures and treatments we offer. Research studies in fetal treatment for certain conditions also may be available to you. Finally, as an academic medical center, we provide innovative research, depth of medical expertise, and the latest technologies and fetal treatment techniques. We’re also part of Ohio State, which means we have access to resources, equipment and support — including the region’s only Prenatal Reference Laboratory — that make certain treatments possible only here. Uncertainty surrounding the diagnosis of a developmental abnormality in your baby can be extremely confusing and distressing. Our team of experienced perinatologists, sonographers, genetic counselors and nurses provide expert, compassionate care from diagnosis to delivery. We coordinate all screenings and diagnostic procedures, working with your primary ob/gyn to develop a birthing plan. Additionally, in advance of delivery, we coordinate the plan for your baby’s care with our Neonatal Intensive Care Unit (NICU) and any necessary pediatric specialists. Steven Gabbe, MD, discusses how maternal medical complications can influence fetal growth and development and how treating a mom can improve outcomes.